An action plan to develop the Lincolnshire Wolds as a tourist destination has been unveiled. The Destination Plan for the Lincolnshire Wolds will see the creation of a visible marketing brand and website. 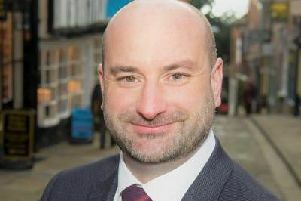 District councillor Adam Grist, portfolio holder for market towns and rural economy, was speaking at the launch of the East Lindsey Economic Action Plan. He said: “There is a big potential for the Lincolnshire Wolds as a tourist destination but it is not as well known as it could be. The East Lindsey Economic Plan for the district was outlined in the £3 million Skegness Aquarium - chosen as a prime example of the local authority working with the private sector to deliver top quality attractions. Coun Steve Kirk, portfolio holder for coastal economy responsibilities, spoke on behalf of ‘Team East Lindsey’ and said the need for an action plan was evident. East Lindsey has signed up to the Greater Lincolnshire Local Enterprise Partnership (GLLEP) Strategic Plan, which seeks to set the right conditions for development, promote infrastructure to sustain economic growth, and ensure a successful mix of large multinational retailers and small niche shops. The visitor economy is worth around £584 million to East Lindsey each year, with more than 4,270,000 enjoying breaks in the area. A number of exciting projects, including a coastal marina and the re-opening of Louth Navigation canal with cycleways, were revealed at the launch on Friday. Poynton’s, of High Street, Horncastle, was awarded £1,237 as part of the shop fronts scheme. A car parking review will look at how tariffs and capacity can support local economic prosperity.